These cupcakes make really good paleo cupcakes with coconut flour recipe because of the snickerdoodle flavoring. Since they are already darker in color, due to the flours used, the cinnamon goes really well with it and all the ingredients used. I sprinkled the tops with a cinnamon sugar make of coconut palm sugar and cinnamon and it really gave them a fun texture. This recipe is definitely customizable with other flavors, but I went with the snickerdoodle because it was the most natural. Cupcakes are a classic, easy and fun dessert for any birthday or another party. They can don’t even have to be for a party, cupcakes are great anytime and anywhere. I love how customizable and individual cupcakes can be. They are already portioned and can be easily distributed to everyone you want to share the deliciousness with! Whether it is to bring to your child’s school class or on a picnic, cupcakes are very versatile! And these must be easy because my 10-year-old daughter has made them. They didn’t look quite like the picture, but they still tasted good and they were fun to make – and it doesn’t hurt that her favorite kind of cookie is snickerdoodles. So these paleo cupcakes with coconut flour were right up her alley. It was especially nice because she made these cupcakes for her little brother and made his day since he couldn’t eat what everyone else was eating. What flavor of cupcake do you want to make with our new paleo cupcakes with coconut flour recipe? Share ideas and images with us! Can’t wait to see what you come up with! This is a recipe for paleo cupcakes with coconut flour and they are made to taste like snickerdoodle cookies. Preheat the oven to 350 degrees. Line 2 muffin tins with a total of 16 cupcake liners. Place the coconut flour, almond flour, cinnamon, baking powder, and salt in a small bowl and mix together with a whisk. In another bowl, combine the eggs, egg whites, honey, vanilla, and coconut milk, beating together well with a whisk. Add the dry ingredients to the wet ingredients, whisking until well combined. Add the melted butter to the batter and mix in well. Let the batter sit for 5 minutes to allow the coconut flour time to absorb the liquids. Divide batter evenly between cupcake liners and bake for 20-22 minutes, or until tops of cake are firm to the touch and spring back. Place the butter, honey, cinnamon, and coconut flour in a bowl and beat with a mixer until well combined. Beat in the coconut cream, 1 t. at a time, until fully incorporated. Mixture should be thick and glossy. Scoop into a piping back and pipe on top of cooled cupcakes. 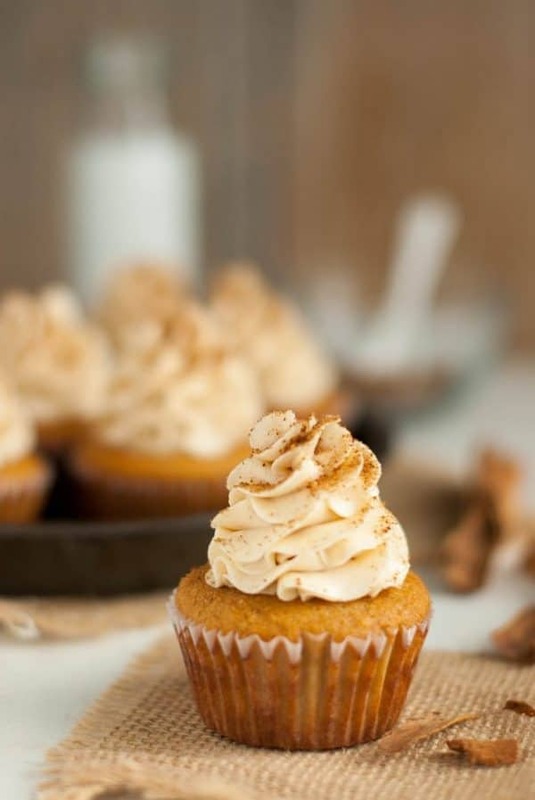 Mix the coconut palm sugar and ¼ t. cinnamon together and sprinkle desired amount on top of cupcakes. These are 9 of our Favorite Paleo Cupcakes Recipes – This is Cupcake Heaven with a pretty amazing lineup. If you are looking for Paleo cupcakes recipes? Well, you’ve come to the right place. They don’t have to be dry and coarse and not taste so good. With these Paleo cupcakes recipes, you are going to be mighty surprised to see how good they taste. 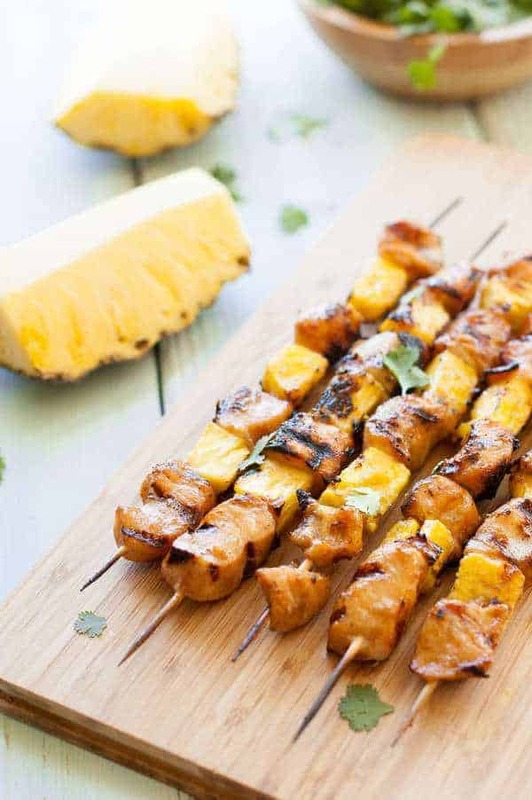 Even if you haven’t tried the Paleo lifestyle, you might want to after seeing THESE options! There are some pretty amazing recipes here. I, myself, am partial to chocolate, but I was amazed at the variety of flavors I found… from chocolate to vanilla to zucchini… to carrot. Many of these Paleo cupcakes recipes have great frosting recipes that go with them. Paleo never tasted so good. Some of these are fairly easy to make and some are a little more difficult. You can pick and choose which ones you want to try first. These are similar to some muffins that Danielle makes. So do you know the difference between a cupcake and a muffin? Do you even care what the difference is? Cupcakes are typically and little more sweet and muffins are denser. A big difference also is that cupcakes usually have frosting and muffins don’t. Muffins are typically eaten for breakfast because they aren’t as sweet and cupcakes are usually eaten for dessert. Do you agree with my reasons? How do you feel about frosting? Taylor thinks that the cake should be something like about 20% cake and 80% frosting. I think it should be more like 20% frosting and 80% cake. What do you think? Do you like a lot of frosting or not? Truth is it depends on what the frosting is made with. Since this is made with coconut sugar and honey and is more healthy, I might go for a bigger percentage of frosting. These are double chocolate with a dark raw chocolate frosting. They are pretty quick and easy to make with 6 ingredients and yet they are super moist, indulgently chocolaty and subtly sweet. The frosting puts them over the top with its gorgeous glossy glow. The frosting is incredibly simple with only 3 ingredients. That’s 9 ingredients all together. Did you know that there is some debate in the world as to whether bacon is actually Paleo? Some say it isn’t because it cured and might have added brown sugar. Well, I’m here to end that debate. Duh! Just make sure you buy bacon that doesn’t have added brown sugar. AND buy bacon that is uncured. I buy it all the time, it’s delicious uncured and so much healthier. Debate over!. Now for a question. Would you eat cupcakes with bacon in it? Just so you know she puts bacon inside the cake and she puts bacon fat in the frosting. You can see it on top of the frosting too. The kicker here is you have to cook the bacon the day before because you have to put the bacon fat in the frig so it will harden. Unless you keep your bacon fat in the frig leftover from previous meals you’ve made. Do you do that? Keep your leftover bacon fat. These sweet vanilla cupcakes are perfectly moist with a thick icing that is ganache-like. The cake is delicious but the ganache is what makes it amazing. It’s has a rich, thick perfect sweetness/chocolate balance that’s fudgy. The ganache could be good on a lot of other desserts. I’m thinking about maybe doughnuts or a regular cake. What would you put it on? This is a coconut cupcake with zesty lime topped with whipped creamy coconut icing. After it’s baked and frosted you sprinkle it with lime zest. I recommend keeping these in the fridge after they are iced because the icing keeps it’s shape best when it’s cold. You can add more lime juice to the batter if you’re a big fan of citrus. These are sweetened some of the most natural sweeteners there are. What’s more natural than bananas, carrots and maple syrup? I have discovered the beauty of Paleo flour. It’s is perfect for baking. It is a combination of 4 different gluten-free flours and it makes so much easier than measuring out 4 different flours. Not to mention buying and storing them. I have a whole post about Paleo Flour with other recipes I think you’d like to check out. I did a little investigation and discovered that Kite Hill Almond Milk Yogurt can be purchased at Target and maybe other stores also. I’d try looking at Sprouts. I’m so excited to learn about all these Paleo options. Are you? Okay, so growing up my grandmother had a recipe for chocolate cake made with zucchini. It was actually delicious and I had no idea it had zucchini in it. I discovered it as I got older and realized how moist the zucchini made it. This looks very similar to Grandma’s cake recipe but of course, these are Paleo and Grandma’s weren’t. That frosting sure makes me want to lick the computer screen. I’m looking forward to trying all of your recipes, especially the desserts! 😊 I was wondering if I’ll need to make any adjustments for high altitude baking. I know we’re not far apart as far as elevation goes, but I’m very new to paleo baking so I’d like to get it right! Any pointers would be much appreciated. Thank you for sharing your fantastic recipes! I’m not really sure but I’m in Utah so I would think we have a fairly similar altitude. Thank you, so appreciate your sweet creations for a Paleo diet! For the person who asked about egg substitute, if she is just allergic to chicken eggs like I am she might use Duck or Quail eggs instead. I’ve been forever searching for a great refined-sugar-free buttercream recipe. Instead of flavoring your buttercream base with cinnamon do you think I can put in a little strawberry jam? What are your thoughts? Will it become too slack? It may be too slack. Totally depends on how thick the jam is. I would love to know if you tried it and how it turned out. Sorry it took so long to respond. Summers are crazy around here. I made 4 paleo desserts for my son’s 4th of July party; these cupcakes were everyone’s favorite! So good to hear! Thanks so much. I’m wondering if I could use monk fruit instead of honey as the sweetener, since we are on a very low carb diet and need to avoid the additional glucose. Thanks. I haven’t tried it myself, but I will post this in case someone else has tried it. I successfully made this recipe into a cake. I don’t have round pans so I just used a glass baking dish. I baked it at 325 degrees for 45 minutes and it came out fluffy and golden. Oh good! I’m glad it turned out and I’m glad you commented because other people are people wondering if this recipe would work as a cake too. What size baking dish did you use, please? Thank you for your comment! Can you put in cream or milk instead of coconut milk? I don’t think an egg substitute, like a flax egg would work because of the coconut flour and how much egg it absorbs. I am allergic to chicken eggs and chicken, but can eat Duck eggs. Do you know if your allergy is specific to chicken or is it all poultry? You might be able to use Duck or Quail eggs like I do. I am thinking of trying this recipe for a small birthday cake. 1) Has anyone attempted making this as small round cakes or a slab cake? If so, did it cook through and turn out the same texture etc? 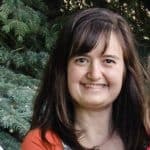 I’m allergic to coconut milk – can I use almond milk or something else in its place? Can’t wait to make these for my son’s birthday party next weekend. Do you think this would hold up as an 8″ round cake? I’m not sure. You would want to cook it longer and maybe on a lower temperature for best results. Please let me know if you try so you can help other people. This is not dairy free as the title says. Butter is dairy. I am going to sub the butter for Earth Balance vegan buttery sticks. You are right, and I fixed it. Thank you for the help. But where it says 6 eggs and 2 egg whites does that mean the 6 eggs are just the yolks>? Also is using Ghee butter ok as a sub.? Thanks.. So keen to try these! The 6 eggs is 6 whole eggs (yolk and white) plus 2 egg whites. As far as the ghee I am unsure. I would give it a try to a small batch to see if it works well for you. We would love to know how it turns out if you try it. OMG It’s the most similar paleo dessert I’ve ever made to its non-paleo cousin! DELISH! These look really yummy! I have some coconut flour that needs using! Maybe I’ll give these a try! These look great! 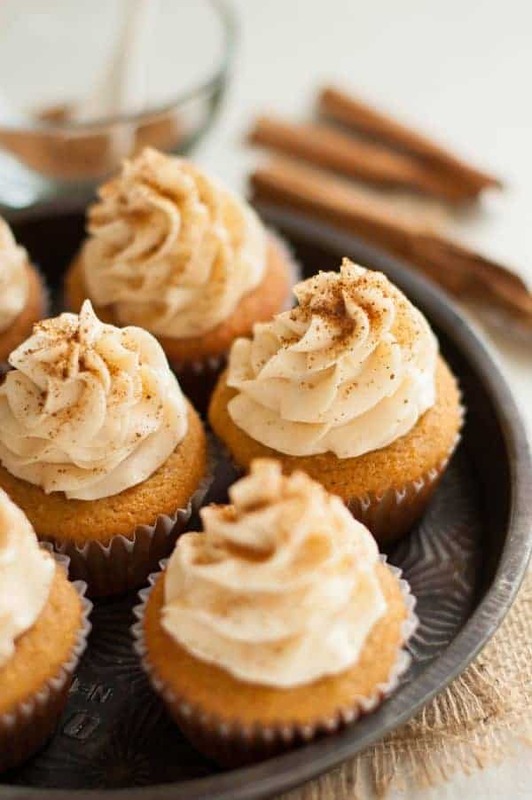 Love how you’ve made a Snickerdoodle into a cupcake and made it paleo! These cupcakes look amazing! I love snickerdoodles so this is perfect for me! These look absolutely amazing! I’ve been wanting to try a recipe with almond flour, but I haven’t taken the leap yet. Funny how something so silly as trying a new flour can seem daunting 😉 But this recipe might just help me take the plunge. Thanks for sharing! 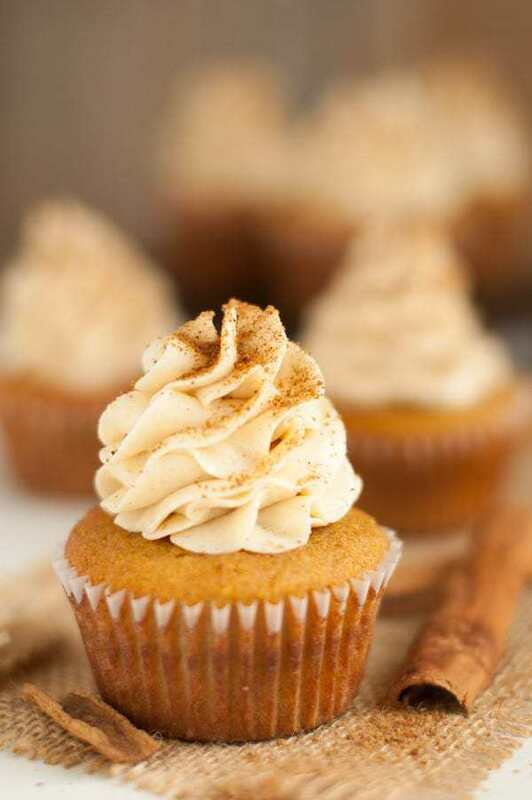 Snickerdoodles are one of my favorite cookies, so I would probably LOVE a cupcake form! Thanks so much! I’m a huge fan of almond flour and coconut flour. And this frosting looks absolutely divine! I can’t wait to try these. This is my first visit to your website, and I’ll definitely be back! Please let me know if you like the cupcakes. My 10 yo daughter loves to make these. i made these tonight. Followed the recipe exactly. They were so delicious!! Thank you for your recipes!! I cant wait to try this. I love making cupcakes but I haven’t made any since going Paleo last summer. I have a week off next week and I am on a mission to find a few good Paleo cupcake recipes, I cant wait to try these! My favorite cookies in a healthier cupcake! I can’t wait to try! Mmm Snickerdoodle goodness, these look fantastic, and I love that the cup cake recipe is easy on the almond flour, can’t wait to try these and a few variations! Any ideas on ratios for replacing almond flour with tapioca or arrowroot? I have a nut allergy and don’t use almond flour. Thanks!! Do you have a substitute for butter? Strictly speaking, butter is not allowed by conventional paleo. You can try coconut butter, not oil but it won’t be the same. I don’t use butter in my regular Paleo cooking but it’s really hard to substitute it for sweet and sweets should be eaten on a rare occasion anyway so that’s why I use them in some of my dessert recipes. Plus, for years I was allergic to dairy but I could eat butter since it doesn’t have the casein in it. My youngest daughters 1st birthday is coming up, going to try to make these for the party! Oh, wow, these look so yummy! I am looking forward to giving these a try! Thanks for stopping by and please let us know how they turned out! Would melted coconut oil work for the butter here? Our version of paleo restricts all dairy products, including butter. In the cupcake itself, melted coconut oil would be fine, but for the buttercream, you would need to make sure that the coconut oil stays cool or else it won’t form a solid frosting. Love it! Whilst it may seem silly to some, cupcakes are important and when your dietary needs preclude them you want them even more! Ha ha! You’re not kidding. They are also good to take to group events for people who don’t understand anything about the Paleo diet. These are beautiful! Any idea if I could sub coconut oil for the butter? Thank you! You could certainly try subbing coconut oil for butter, but make sure that you keep the coconut oil cool so that it does not melt.